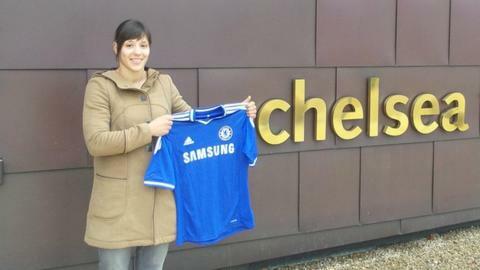 Striker Rachel Williams hopes joining Chelsea from Birmingham can kick-start her England career. In 2011, the 25-year-old was the FA Women's Super League's top scorer but she has only 13 England caps with her last appearance in March. Now she aims to impress the new England boss, set to be named this month. "My international career has come to a bit of a stop but I know this is the right club to get me back in the window for England," she said. "I am just going to work hard and ensure whoever the next England manager will be I catch their eye and they think 'you know what, we need her in the England team'." Williams' last England outing came when the team won the Cyprus Cup by beating Canada 1-0. But she was not picked in Hope Powell's Euro 2013 squad and has not featured in caretaker boss Brent Hills's plans as England started their 2015 World Cup qualification campaign with four wins from four games. Williams, who was twice a runner-up in the WSL with Birmingham before they finished 16 points behind title winners Liverpool last season, said she was looking forward to teaming up with Chelsea manager Emma Hayes. And she will also join an attack that includes fellow England international Eniola Aluko and Japanese international Yuki Ogimi. Williams said: "I'm really excited and have been ever since I met up with [assistant manager] Paul Green and Emma and they told me what they are determined to do here. They are determined to be competitive next year and I am really looking forward to it. "It's an exciting season for sure and hopefully we can win something."